This week went by in a whirldwind. While it wasn't full of adventure and trips like last week, it was extremely busy. I happened to try a lot of new things jn the beauty category in the last few weeks, and there are some things that are okay, and some that are fabulous. Here are the items that I really appreciated this week. I was about to run out of my beloved Clarins Express eyemakeup remover and was curious if there were any products out there that did a similar job for a slightly smaller price tag. And I think I have found it in the form of the Body Shop Camomile waterproof eye and lip makeup remover. Easy breezy makeup removal with just a quick shake of the bottle and the solution is activated. It lifts makeup super easily and my favorite part is that it doesn't leave any greasy residue on the skin. It might even be better than the Clarins. Something from Clarins that I really have been loving this last week is the Beauty Flash Balm. Described as the ultimate pick-me-up for tired and stressed skin. I use it as a primer underneath my base and it keeps my skin moisturised all day, and it provides a beautiful glow. I do like myself a dewy base. There's no denying that with winter comes dry lips and hands. And I have found just the products to counteract the nasty effects caused by the harsh winds and low temperatures. Tromborg Lip Cure picked up in Copenhagen and & Other Stories Shinjuku Bloom handcream. Both do a wonderful job at keeping moisture in and making sure that hands and lips are deliciously soft. And they smell beautiful, absolutely beautiful. I mentioned my skin freakout on the blog earlier last week and that I bought some products that I hope would help calm it down. And after just a week of using the La Roche Posay Effaclar AI day and night I can say I only have one little spot left, and that one is easily covered by a light coverage foundation. In the first few days this product shrunk my spots and diminished the angry redness. My cheeks are completely cleared up and if I watch my diet no new ones will be popping up. Makeup wise I haven't really been experimental this week. 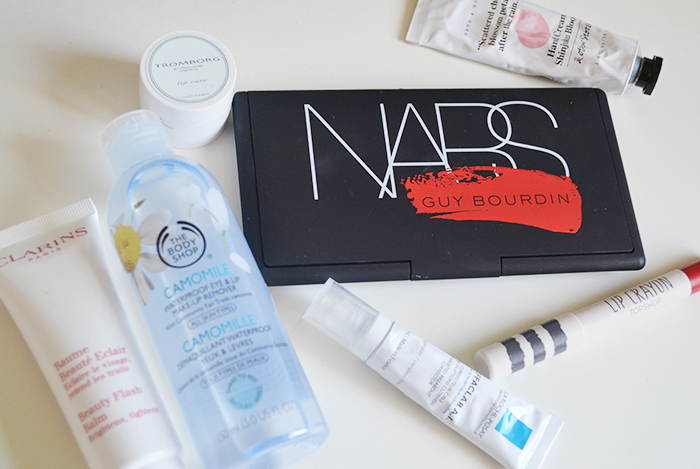 I've only used the Nars One Night Stand palette because it holds every blush you'll ever need. The colors and formulas are wonderful and last beautifully on the skin. If I want to fancy-fy my makeup routine I take the Topshop Lipstick in Royal. It's super easy in use and provides a gorgeous deep red color with a matte finish that lasts hours and hours on the lips. This even survives an eight hour work shift where I basically talk non-stop. No other lipstick has done that for me before. With Christmas and my birthday just around the corner I'm desperate to find something to put on my face during these special days. What have been your favorite products lately?